WASHINGTON COUNTY, Ind. 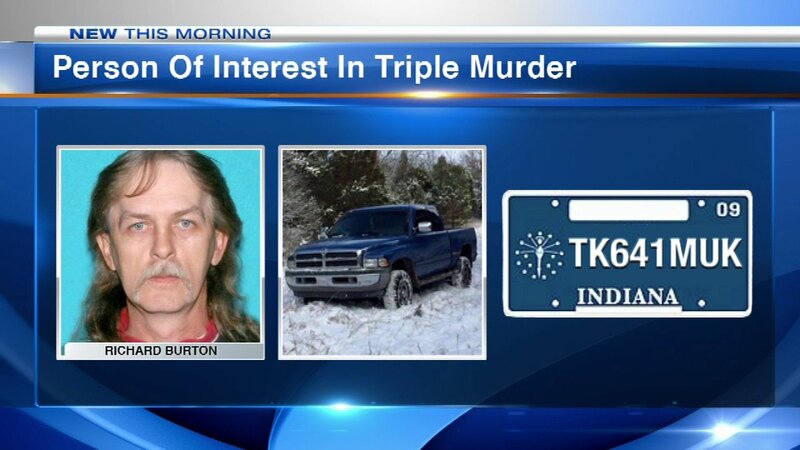 (WLS) -- A person of interest in the deaths of three people in Indiana was found dead Monday morning in his vehicle in Monroe County, authorities said. Officers conducting a well-being check at a home in the 5800-block of South Beck's Mill Road in rural Washington County, about 14 miles from Salem, Ind., found three people dead inside the residence around 4:30 p.m. Sunday. Indiana State Police did not say how the victims died. Autopsies are expected to be complete by Tuesday morning. Their identities have not been released. Richard Lee Burton Jr., 47, was identified as a person of interest in the case. State police said he was considered armed and dangerous and was believed to be driving a blue 1997 Dodge Ram 4x4 2500 with an extended cab and Indiana license plate TK641MUK. Police said he could have been heading to Tennessee, Missouri or Texas. Just after 8 a.m. Monday, the Monroe County Sheriff's Department received a tip that said a man matching Burton's description was inside that pickup truck, parked at the Blackwell Horse Camp near State Road 446. Deputies found that man dead inside the truck. The Monroe County Coroner's Office has yet to confirm the man's identity, but state police believe it was Burton. The man's cause of death has not been released.